Farrokh Bulsara (5 September 1946 – 24 November 1991), known professionally as Freddie Mercury, was a British singer-songwriter and record producer, best known as the lead vocalist of the rock band Queen. He was known for his flamboyant stage persona and four-octave vocal range. Mercury wrote numerous hits for Queen, including "Bohemian Rhapsody", "Killer Queen", "Somebody to Love", "Don't Stop Me Now", "Crazy Little Thing Called Love", and "We Are the Champions". He led a solo career while performing with Queen, and occasionally served as a producer and guest musician for other artists. Mercury was born of Parsi descent on Zanzibar, and grew up there and in India before moving with his family to Middlesex, England, in his late teens. He formed Queen in 1970 with guitarist Brian May and drummer Roger Taylor. Mercury died in 1991 at age 45 due to complications from AIDS, having confirmed the day before his death that he had contracted the disease. Mercury was born Farrokh Bulsara in Stone Town in the British protectorate of Zanzibar (now part of Tanzania) on 5 September 1946. His parents, Bomi (1908–2003) and Jer Bulsara (1922–2016), were Parsis from the Gujarat region of the then-province of Bombay Presidency in British India. As Parsis, Mercury and his family practised the Zoroastrian religion. 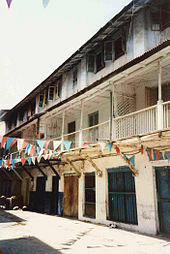 The Bulsara family had moved to Zanzibar so that his father could continue his job as a cashier at the British Colonial Office. He had a younger sister, Kashmira. Mercury was born with four supernumerary incisors. Mercury spent most of his childhood in India and began taking piano lessons at the age of seven. In 1954, at the age of eight, Mercury was sent to study at St. Peter's School, a British-style boarding school for boys, in Panchgani near Bombay (now Mumbai). At the age of 12, he formed a school band, the Hectics, and covered rock and roll artists such as Cliff Richard and Little Richard. One of Mercury's former bandmates from the Hectics has said "the only music he listened to, and played, was Western pop music." A friend from the time recalls that he had "an uncanny ability to listen to the radio and replay what he heard on piano". It was also at St. Peter's where he began to call himself "Freddie". He also attended St. Mary's School, Mumbai. In February 1963 he moved back to Zanzibar where he joined his parents at their flat. At the age of 17, Mercury and his family fled from Zanzibar for safety reasons due to the 1964 Zanzibar Revolution, in which thousands of Arabs and Indians were killed. The family moved into a small house at 22 Gladstone Avenue, Feltham, Middlesex, England. Mercury enrolled at Isleworth Polytechnic (now West Thames College) in West London where he studied art. He ultimately earned a diploma in Art and Graphic Design at Ealing Art College (now the Ealing campus of University of West London), later using these skills to design the Queen heraldic arms. A British citizen at birth, Mercury remained so for the rest of his life. Following graduation, Mercury joined a series of bands and sold second-hand clothes in Kensington Market in London with girlfriend Mary Austin. He also held a job as a baggage handler at Heathrow Airport. Friends from the time remember him as a quiet and shy young man who showed a great deal of interest in music. In 1969 he joined the Liverpool-based band Ibex, later renamed Wreckage. He lived briefly in a flat above the Liverpool pub, The Dovedale Towers. When this band failed to take off, he joined a second band called Sour Milk Sea. However, by early 1970 this group had broken up as well. In April 1970 Mercury joined guitarist Brian May and drummer Roger Taylor who had previously been in a band called Smile. In 1971 they were joined by bassist John Deacon. Despite reservations of the other members and Trident Studios, the band's initial management, Mercury chose the name "Queen" for the new band. He later said, "It's very regal obviously, and it sounds splendid. It's a strong name, very universal and immediate. I was certainly aware of the gay connotations, but that was just one facet of it." At about the same time, he changed his surname, Bulsara, to Mercury. Mercury designed Queen's logo, called the Queen crest, shortly before the release of the band's first album. The logo combines the zodiac signs of all four members: two lions for Leo (Deacon and Taylor), a crab for Cancer (May), and two fairies for Virgo (Mercury). The lions embrace a stylised letter Q, the crab rests atop the letter with flames rising directly above it, and the fairies are each sheltering below a lion. There is also a crown inside the Q and the whole logo is over-shadowed by an enormous phoenix. The whole symbol bears a passing resemblance to the Royal coat of arms of the United Kingdom, particularly with the lion supporters. In addition to his work with Queen, Mercury put out two solo albums and several singles. Although his solo work was not as commercially successful as most Queen albums, the two off-Queen albums and several of the singles debuted in the top 10 of the UK Music Charts. His first solo effort goes back to 1972 under the pseudonym Larry Lurex, when Trident Studios' house engineer Robin Geoffrey Cable was working in a musical project, at the time when Queen were recording their debut album; Cable enlisted Mercury to perform lead vocals on the songs "I Can Hear Music" and "Goin' Back", both were released together as a single in 1973. Eleven years later, Mercury made a contribution to the Richard "Wolfie" Wolf mix of Love Kills on the 1984 album (the song also used as the end title theme for National Lampoon's Loaded Weapon 1) and new soundtrack to the 1927 Fritz Lang film Metropolis. The song, written by Giorgio Moroder in collaboration with Mercury, debuted at the number 10 position in the UK charts. It was produced by Moroder and Mack. Mack also produced the 1987 single "Hold On" which Mercury recorded with actress Jo Dare for a German action drama Zabou. Mercury's two full albums outside the band were Mr. Bad Guy (1985) and Barcelona (1988). Mr. Bad Guy debuted in the top ten of the UK Album Charts. In 1993, a remix of "Living on My Own", a single from the album, posthumously reached number one on the UK Singles Charts. 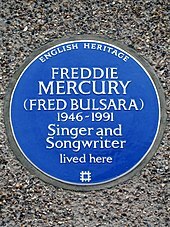 The song also garnered Mercury a posthumous Ivor Novello Award from the British Academy of Songwriters, Composers and Authors. Allmusic critic Eduardo Rivadavia describes Mr. Bad Guy as "outstanding from start to finish" and expressed his view that Mercury "did a commendable job of stretching into uncharted territory". In particular, the album is heavily synthesiser-driven in a way that is not characteristic of previous Queen albums. In the early 1970s, Mercury had a long-term relationship with Mary Austin, whom he met through guitarist Brian May. He lived with Austin for several years in West Kensington, London. By the mid-1970s, the singer had begun an affair with a male American record executive at Elektra Records, and in December 1976, Mercury told Austin of his sexuality, which ended their romantic relationship. Mercury moved out of the flat they shared, into 12 Stafford Terrace in Kensington and bought Austin a place of her own nearby. They remained close friends through the years, with Mercury often referring to her as his only true friend. In a 1985 interview, Mercury said of Austin, "All my lovers asked me why they couldn't replace Mary [Austin], but it's simply impossible. The only friend I've got is Mary, and I don't want anybody else. To me, she was my common-law wife. To me, it was a marriage. We believe in each other, that's enough for me." He also wrote several songs about Austin, the most notable of which is "Love of My Life". Mercury's final home, Garden Lodge, 1 Logan Place, a twenty-eight room Georgian mansion in Kensington set in a quarter-acre manicured garden surrounded by a high brick wall, had been picked out by Austin. In his will, Mercury left his London home to Austin, rather than his partner Jim Hutton, saying to her, "You would have been my wife, and it would have been yours anyway." Mercury was also the godfather of Austin's oldest son, Richard. During the early- to mid-1980s, he was reportedly involved with Barbara Valentin, an Austrian actress, who is featured in the video for "It's a Hard Life". However, in another article, Valentin was "just a friend", and Mercury was really dating German restaurateur Winfried Kirchberger during this time. By 1985, he began another long-term relationship with hairdresser Jim Hutton (1949–2010). Hutton, who was tested HIV-positive in 1990, lived with Mercury for the last six years of his life, nursed him during his illness, and was present at his bedside when he died. Hutton said Mercury died wearing the wedding band that Hutton had given him. Radio DJ Kenny Everett first met Mercury in 1974 when he invited the singer onto his breakfast show on Capital London. As two of Britain's most flamboyant, outrageous, and best-loved entertainers, they shared much in common and instantly became close friends. Everett would play a major role in Queen's early success when, in 1975, armed with an advance copy of the single "Bohemian Rhapsody", Mercury went to see Everett. While privately Everett doubted any station would play the song due to its length at over 6 minutes, he said nothing to Mercury and placed the song on the turntable, and, after hearing it, enthused: "forget it, it's going to be number one for centuries". While Capital Radio hadn't officially accepted the song, the anarchic Everett would talk incessantly about a record he had but couldn't play, before the song "accidentally" started playing, with Everett stating: "Oops, my finger must've slipped." Capital's switchboard was jammed with callers wanting to know when the song was going to be released – on one occasion Everett aired the song 36 times in one day. During his career, Mercury's flamboyant stage performances sometimes led journalists to allude to his sexuality. Dave Dickson, reviewing Queen's performance at Wembley Arena in 1984 for Kerrang!, noted Mercury's "camp" addresses to the audience and even described him as a "posing, pouting, posturing tart". In 1992, John Marshall of Gay Times expressed the following opinion: "[Mercury] was a 'scene-queen,' not afraid to publicly express his gayness, but unwilling to analyse or justify his 'lifestyle'... It was as if Freddie Mercury was saying to the world, 'I am what I am. So what?' And that in itself for some was a statement." In an article for AfterElton, Robert Urban stated: "Mercury did not ally himself to 'political outness,' or to LGBT causes." In 1987, Mercury celebrated his 41st birthday at the Pikes Hotel, Ibiza, several months after discovering that he had contracted HIV. Mercury sought much comfort at the retreat and was a close friend of the owner, Anthony Pike, who described Mercury as "the most beautiful person I've ever met in my life. So entertaining and generous." According to biographer Lesley-Ann Jones, Mercury "felt very much at home there. He played some tennis, lounged by the pool, and ventured out to the odd gay club or bar at night." The party, held on 5 September 1987, has been described as "the most incredible example of excess the Mediterranean island had ever seen", and was attended by some 700 people. A cake in the shape of Gaudi's Sagrada Família was provided for the party, although the original cake collapsed and was replaced with a 2-metre-long sponge cake with the notes from Mercury's song "Barcelona". The bill, which included 232 broken glasses, was presented to Queen's manager, Jim Beach. 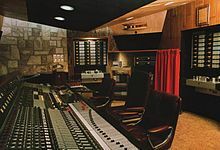 Mountain Studios in Montreux, Switzerland, Queen's recording studio from 1978 to 1995. Mercury recorded his final vocal here in May 1991. In December 2013, the studio was opened free as the "Queen Studio Experience", with fans asked for a donation to the Mercury Phoenix Trust charity. In October 1986, the British press reported that Mercury had his blood tested for HIV/AIDS at a Harley Street clinic. A reporter for The Sun, Hugh Whittow, questioned Mercury about the story at Heathrow Airport as he was returning from a trip to Japan. Mercury denied he had the disease. According to his partner Jim Hutton, Mercury was diagnosed with AIDS in late April 1987. Around that time, Mercury claimed in an interview to have tested negative for HIV. Despite the denials, the British press pursued the rampant rumours over the next few years, fuelled by Mercury's increasingly gaunt appearance, Queen's absence from touring, and reports from former lovers to various tabloid journals. By 1990, the rumours about Mercury's health were rife. At the 1990 Brit Awards held at the Dominion Theatre, London, on 18 February, a visibly frail Mercury made his final appearance on stage when he joined the rest of Queen to collect the Brit Award for Outstanding Contribution to Music. Towards the end of his life, he was routinely stalked by photographers, while The Sun featured a series of articles claiming that he was ill; notably in an article from November 1990 that featured an image of a haggard-looking Mercury on the front page accompanied by the headline, "It's official – Freddie is seriously ill."
After the conclusion of his work with Queen in June 1991, Mercury retired to his home in Kensington, west London. His former partner, Mary Austin, had been a particular comfort in his final years, and in the last few weeks of his life made regular visits to his home to look after him. Near the end of his life Mercury was starting to lose his sight, and he deteriorated to the point where he could not get out of bed. Due to his worsening condition, Mercury decided to hasten his death by refusing to take his medication and continued taking only painkillers. On the evening of 24 November 1991, just over 24 hours after issuing that statement, Mercury died at the age of 45 at his home in Kensington. The official cause of death was bronchial pneumonia resulting from AIDS. Mercury's close friend, Dave Clark of the Dave Clark Five, had taken over the bedside vigil when he died. Austin phoned Mercury's parents and sister to break the news of his death, which reached newspaper and television crews by the early hours of 25 November. On 27 November, Mercury's funeral service at West London Crematorium was conducted by a Zoroastrian priest. In attendance at Mercury's service were his family and 35 of his close friends, including the remaining members of Queen and Elton John. His coffin was carried into the chapel to the sounds of "Take My Hand, Precious Lord"/"You've Got a Friend" by Aretha Franklin. In accordance with Mercury's wishes, Mary Austin took possession of his cremated remains and buried them in an undisclosed location. The whereabouts of his ashes are believed to be known only to Austin, who has stated that she will never reveal where she buried them. In his will, Mercury left the vast majority of his wealth, including his home and recording royalties, to Mary Austin and the remainder to his parents and sister. He left £500,000 to his chef, Joe Fanelli; £500,000 to his personal assistant, Peter Freestone; £100,000 to his driver, Terry Giddings; and £500,000 to Jim Hutton. Austin continues to live at Mercury's former home, Garden Lodge, Kensington, with her family. 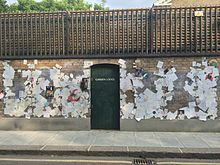 The outer walls of Garden Lodge in 1 Logan Place became a shrine to Mercury following his death, with mourners paying tribute by covering the walls in graffiti messages. Three years after his death, Time Out magazine reported, "Since Freddie's death, the wall outside the house has become London's biggest rock 'n' roll shrine." Fans continue to visit to pay their respects with messages in letters appearing on the walls. Hutton was involved in a 2000 biography of Mercury, Freddie Mercury, the Untold Story, and also gave an interview for The Times in November 2006 for what would have been Mercury's 60th birthday. In November 1995, Queen released Made in Heaven, an album featuring Mercury's previously unreleased final recordings from 1991—as well as outtakes from previous years and reworked versions of solo works by the surviving members. The album cover features the Freddie Mercury statue that overlooks Lake Geneva superimposed with Mercury's Duck House lake cabin that he had rented. This is where he had written and recorded his last songs at Mountain Studios. The sleeve of the album contains the words, "Dedicated to the immortal spirit of Freddie Mercury." Brian May announced in a September 2010 BBC interview that Sacha Baron Cohen, known for his comedic characters Borat, Ali G, and Brüno, had been cast to play Mercury in a biographical film. Time commented with approval on his singing ability and resemblance to Mercury. The film would be written by Peter Morgan, Academy Award-nominated for his screenplays The Queen and Frost/Nixon. The film, which was being co-produced by Robert De Niro's TriBeCa Productions, was going to focus on Queen's formative years and the period leading up to the celebrated performance at the 1985 Live Aid concert. Filming was planned to begin sometime in 2011. In April 2011, May confirmed that pre-production work was continuing. He said the band had approved a team to start filming later in 2011, and Baron Cohen's eagerness had been the key to progress. However, in July 2013, Baron Cohen dropped out of the role due to creative differences with the members of Queen. May said they had parted on good terms and said that the band had felt Cohen's presence would have been distracting. In December 2013, it was announced that Ben Whishaw, best known for playing Q in the James Bond films Skyfall and Spectre, had been chosen to replace Cohen as Mercury. British actor and director Dexter Fletcher was announced as director, but withdrew from the project in March 2014. Production had been due to begin in the summer of 2014; any delays would cause further problems, with Whishaw committed to begin work on the next James Bond film towards the end of the year. In late 2015, producers GK Films hired Anthony McCarten to write a new screenplay. In March 2016, during an interview on The Howard Stern Show, Cohen elaborated on his departure and the creative disagreements with May and Taylor – specifically on whether the film's plotline should have continued past Mercury's 1991 death, and his choice of crew, which included Morgan, David Fincher, and Tom Hooper. On 4 November 2016, it was announced that the film was now backed by 20th Century Fox, New Regency, and GK Films, with shooting set to have begun in early 2017. Mercury was to be played by Rami Malek, while Bryan Singer was set to direct. In August 2017, Gwilym Lee, Ben Hardy, and Joseph Mazzello were cast as May, Taylor, and Deacon. On 31 August 2017, Allen Leech was cast as Paul Prenter. In September 2017, the first image of Malek as Mercury was released, as well as further information by Singer regarding the film's timeline of 1970 to the Live Aid performance in 1985, stating that the film is "not a traditional biopic" and will be a story honoring the music, but that Mercury's dark and troubled history will also be honored. On 6 September 2017, Lucy Boynton was cast as Mary Austin. On 5 December 2017, Singer was fired by 20th Century Fox due to "unreliable behaviour" on set, and was replaced with Dexter Fletcher. Singer stated he was disappointed not to be able to finish the film, "a passion project of mine". Released in October 2018, the film received mixed reviews. Malek received praise for his portrayal of Mercury, and the Live Aid segment was also praised, while criticism came from not exploring more complex themes involving Mercury, with the New York Post's Johnny Oleksinski stating: "What we ultimately wanted from Bohemian Rhapsody was not carbon-copied concerts, but behind-closed-doors insight into a deeply private, complicated, internationally beloved superstar." What's the good word on Freddie Mercury?